TVMucho | TVMucho utilise des cookies afin d'améliorer et de personnaliser votre expérience et de cibler ses publications. We reserve the right to refuse our service to anyone for any reason at any time. You understand that your content (not including credit card information), may be transferred unencrypted and involve (a) transmissions over various networks; and (b) changes to conform and adapt to technical requirements of connecting networks or devices. Credit card information is always encrypted during transfer over networks. You agree not to reproduce, duplicate, copy, sell, resell or exploit any portion of our Service, use of the Service, or access to our Service or any contact on the website through which the service is provided, without express written permission by us. Fees. Prices for our Service are subject to change without notice. We reserve the right at any time to modify or discontinue our Service (or any part or content thereof) without notice. We shall not be liable to you or to any third-party for any modification, price change, suspension or discontinuance of our Service. Taxes. Our fees are net of any applicable Sales or Value Added Tax (“Tax”). If any Services, or payments for any goods or services, under this Agreement are subject to Tax in any jurisdiction, you will be responsible for payment of such Tax, and any related penalties or interest and will indemnify us for any liability or expense we may incur in connection with such Taxes. For purposes of this Agreement, "Tax" shall mean any sales, value added or use tax, and any other tax measured by sales proceeds, that we are permitted to pass to you that is (a) the functional equivalent of a sales tax and (b) the applicable taxiing jurisdiction does not otherwise impose a sales or use tax. We may automatically charge and withhold such taxes for orders to be delivered to addresses within any jurisdictions that it deems is required. You will make all payments of fees to us free and clear of, and without reduction for, any withholding taxes. Any such taxes imposed on payments of fees to us will be your sole responsibility, and you will provide us with official receipts issued by the appropriate taxing authority, or such other evidence as we may reasonably request, to establish that such taxes have been paid. When you order products for overseas delivery, you may be subject to import duties and taxes, which are levied when the package with the products arrives at the destination that you specified. Any charges for customs clearance have to be borne by you, as we have no control over such charges and cannot foresee the amount charged (if any). Please also be aware that you are considered the importer of record and must comply with all laws and regulations of such country. Refund Policy: We offer refunds to any unsatisfied customer up to thirty (30) days after the purchase was made. If you would like your money back, simply send us an email at support@tvmucho.com with a description of your problem and request for a refund. The TVMucho service allows subscribers to legitimately watch free-to-air satellite TV channels without the need for a third party contract or a set-top box. For ITV, Channel 4 ad Channel 5 the service is restricted on 3G/4G. TVMucho makes available to its Members and to TVMucho Try For Free Users access to remote antennas and satellite dishes at the TVMucho Switzerland antenna farms. 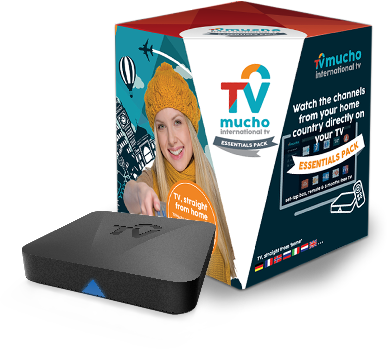 TVMucho allows subscribers to access the service remotely via the Internet utilizing any supported personal devices including smart phones, tablets, personal computers, netbooks and certain other types of devices capable of Internet connection. Other TVMucho managed channels can be delivered in other formats, for example via modern streaming technology. Due to legal restrictions some free-to-air channels can not be viewed via a 3G or 4G connection. The TVMucho technology is fully compliant with the European Court of Justice rulings on free-to air channels and takes care of all licensing on behalf of its subscribers. However, from time to time certain programming, including sports events, may be blacked out in Your local reception area. Blackout restrictions are decided by applicable sports leagues and other entities that may own local broadcasting rights. Our Service provides you with the ability to locate and access free to air and subscription streaming services. We do not offer any right to access subscription services which require the payment of a fee to third parties or otherwise have restrictions to access. Any access to such subscription or restricted services must be solely obtained by you from the provider. All descriptions of our Service is subject to change at any time without notice, at our sole discretion. We reserve the right to discontinue any product at any time. Any offer for any product or service made on this site is void where prohibited. Your subscription to our Service permits you to concurrently use the Services on one applicable device at any one time. In the event that subscription is made for an enhanced subscription services involving 2 or 4 user packages, as we may advise from time to time, the number of devices on which you may simultaneously watch our Service will be restricted to one device per concurrent user, in accordance with your chosen subscription. We do not warrant that the quality of any products, services, information, or other material purchased or obtained by you or that it will meet your expectations, or that any errors in our Services will be corrected. We may provide you with access to third-party tools over which we neither monitor nor have any control nor input. Any use by you of optional tools offered through the site is entirely at your own risk and discretion and you should ensure that you are familiar with and approve of the terms on which tools are provided by the relevant third-party provider(s). We shall have no liability whatsoever arising from or relating to your use of optional third-party tools. Certain content, products and services available via our Service may include materials from third-parties. Third-party links on this site may direct you to third-party websites that are not affiliated with us. We are not responsible for examining or evaluating the content or accuracy and we do not warrant and will not have any liability or responsibility for any third-party materials or websites, or for any other materials, products, or services of third-parties. We are not liable for any harm or damages related to the purchase or use of goods, services, resources, content, or any other transactions made in connection with any third-party websites. Please review carefully the third-party’s policies and practices and make sure you understand them before you engage in any transaction. Complaints, claims, concerns, or questions regarding third-party products should be directed to the third-party. You agree to indemnify us for any claims, costs, expenses or damages suffered by us as a result of your unlawful access or use of third party products or tools in association with our Service. We do not guarantee, represent or warrant that your use of our Service will be uninterrupted, timely, secure or error-free. We do not warrant that the results that may be obtained from the use of our Service will be accurate or reliable. You agree that from time to time we may remove the service for indefinite periods of time or cancel the service at any time, without notice to you. You expressly agree that your use of, or inability to use, our Service is at your sole risk. Our Service and all products and services delivered to you through our Service are (except as expressly stated by us) provided ‘as is’ and ‘as available’ for your use, without any representation, warranties or conditions of any kind, either express or implied, including all implied warranties or conditions of merchantability, merchantable quality, fitness for a particular purpose, durability, title, and non-infringement. In no case We, our directors, officers, employees, affiliates, agents, contractors, interns, suppliers, service providers or licensors be liable for any injury, loss, claim, or any direct, indirect, incidental, punitive, special, or consequential damages of any kind, including, without limitation lost profits, lost revenue, lost savings, loss of data, replacement costs, or any similar damages, whether based in contract, tort (including negligence), strict liability or otherwise, arising from your use of any of our Service or any products procured using the service, or for any other claim related in any way to your use of the service or any product, including, but not limited to, any errors or omissions in any content, or any loss or damage of any kind incurred as a result of the use of our Service or any content (or product) posted, transmitted, or otherwise made available via the service, even if advised of their possibility. Because some states or jurisdictions do not allow the exclusion or the limitation of liability for consequential or incidental damages, in such states or jurisdictions, our liability shall be limited to the maximum extent permitted by law. You agree to indemnify, defend and us hold harmless together with any of our parent, subsidiaries, affiliates, partners, officers, directors, agents, contractors, licensors, service providers, subcontractors, suppliers, interns and employees, from any claim or demand, including reasonable attorneys’ fees, made by any third-party due to or arising out of your breach of these Terms of Service or the documents they incorporate by reference, or your violation of any law or the rights of a third-party. TVMucho utilise des cookies afin d'améliorer et de personnaliser votre expérience et de cibler ses publications. Le site peut aussi comporter des cookies de sites tiers. En visitant ce site, j'accepte l'utilisation des cookies. Learn more. Close .